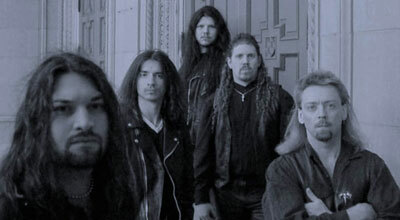 Antithesis (1997-present) is a Progressive Metal band from Cleveland, Ohio, USA. t all started with Sean Perry and Paul Konjicija, two guitarists who met through a want ad. Previously Paul had worked with the local band Ritual who, three years earlier, released an album on 'Massacre Records'. But Paul and Sean together found new inspiration, and with the addition of bassist James Lewis they created the foundation of Antithesis. Ty Cook (vocals) and Paul Kostyack (drums), who had earlier played with Konjicija, would soon be added to the membership. December of 1998 gave them the completion of their self-titled full-length debut, produced by the band themselves. Both Allan Marcus and Tom Guignette took turns briefly as second guitarists in 1999 when Konjicija apparently left for a time. The band would re-publish their debut with Konjicija's lead parts redone. In 2001 they received multi-national distribution for their second outing, Dying For Life, on the 'Nightmare' label. This second outing was an improved effort on their first featuring a historical lyrical bent while not surrendering their progressive metal roots. Sean Perry (guitars), Ty Cook (vocals) and James Lewis (bass) would enter and exit the band before the line-up would settle on Brian Glodde (bass), Paul "Krusty" Kostyack (drums), Paul Konjicija (guitars) andMatt Adkins (vocals) for the release of Dreaming Reality (2010). Strangely, the band has been silent since.